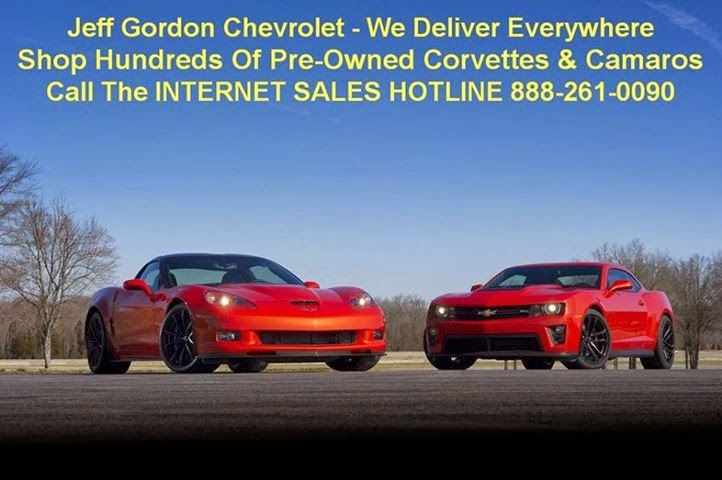 Jeff Gordon Chevrolet in Wilmington, North Carolina is where you'll find hundreds of available GM Certified Pre-owned Corvettes, GM Certified Pre-owned Camaros, plus gently used Corvette and used Camaro models from the sixties, seventies, eighties and nineties. Jeff Gordon Chevrolet has made it easy to find the car of your dreams. Just go to JeffGordonChevy.com and shop Award Winning Web Site 24 hours a day 7 days a week. Our inventory changes daily, so check back often. You can also Click Here and tell us exactly what you're looking for and we'll keep you in the loop with what's available for immediate delivery. Call the INTERNET SALES HOTLINE 888-817-5744 to discuss purchase and shipping options. Find your American “heart beat” in a Corvette or Camaro from Jeff Gordon Chevy .